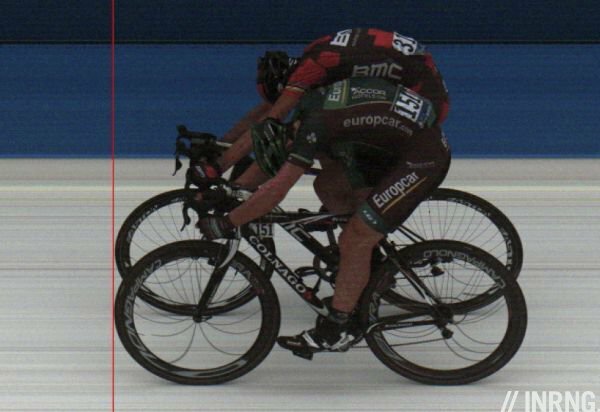 Ever wondered why the spokes appear to bend in a sprint finish when you see the photo finish image from a race? Are the riders going so fast that they flex the spokes? Or is something else at work? Wednesday’s stage in the Tour of Turkey saw Mark Renshaw of Rabobank beat Matthew Goss by 0.008 seconds, a winning margin that was hard to see even with the photo finish image. 1.2.099 The finish line shall comprise a line of 4 cm in width, painted in black on a white strip 72 cm wide thus leaving 34 cm of white on each side of the black line. 1.2.100 The finish occurs at the instant that the tyre of the front wheel meets the vertical plane rising from the starting edge of the finishing line. To this end, the verdict of the photo-finish shall be final. In other words the finish line is the start of the black line on the white band. A rider wins when the front of their wheel crosses the line. Now about those bending spokes. There is no bending. Look again at the images above and note that if the spokes appear to bend, the gaps between the drilled holes on the rim also appear to move and so does the “o” in the Campagnolo decal. Perhaps you could imagine a spoke bending or a different decal, but you cannot drill and lace a wheel for the camera. The second clue to the image being different is the road surface. Look at the horizontal stripes on the ground, this is not normal either. Now you might think spokes bend but propellor blades are not disintegrating in the shot above. Instead the camera is scanning the field only the blades are moving so fast we get an odd image. This Youtube clip shows what is happening, watch the yellow line going down the screen. The yellow line represents the scan and the resulting image is generated by everything captured by the yellow line as it passes down the field. Note it doesn’t “snap” the red propellor, but instead it scans and picks up the rotation in segments. Normally the scan is so fast but when an even faster object, like a propeller blade or a bicycle wheel, enters the field then this is distorted. Note the distortion is only on the fastest moving parts of the bike, namely the outside edges of the rim. Above all there is not distortion to the exact point on the finish line, the front edge of the tyre on the vertical plane is perfect. Races often use timing chips where each bike is fitted with a transponder and a radio loop at the finish picks up the finishing position. But these are indicative for the time and position, after all a rider can change bikes during the race. The final word goes to the finish line camera, as the UCI rule quoted above insists. Many events, including the Tour de France use the Lynx model of camera, capable of 10,000 frames per second. The Tour uses one for each intermediate sprint where a race official and staff are on stand-by to judge the result. At the finish two cameras are deployed, one as back-up just in case of a malfunction. They are placed inside a special box that resembles a large wardrobe that sits on the line. Of course sometimes even the camera can’t split the difference. In 2010 Michael Matthews of Australia won the U-23 World Championships and John Degenkolb took the silver medal. But the photo finish could not separate Guillaume Boivin and Taylor Phinney and four riders stood on the podium with Boivin and Phinney being tied for third place and sharing the bronze medal. Excellent article. Thanks for that. interesting piece, I presume these cameras are expensive things. If camera is very expensive how do small race cope? Or do they eg. buy this in group and lend it out? It can be expensive to buy but it can be rented for the day, useful as it is more than the camera you need to know how to set it up and run the software. There are cheaper versions like a video camera with a high speed “sports” setting and some digital photo cameras can do this too. Small races, even as big as the Jayco Bay Criterium series (January each year, Geelong, Australia), use a video camera set to 1,750 fps and a direct feed to a PC with software which allows replay frame by frame. Whilst not as accurate as the Lynx, it’s sufficient to resist any argument I’ve ever met in my (too) many years as a Commissaire. I prefer to think of it as someone taking lots of photos of the finish line as the riders pass (like a video camera). They then take each photo and just cut the thin white strip of the finish line out of each one and glue them all together (or rather the software does). That is why the background is always white, it’s a photo of the finish line. Or many many photos one pixel wide lined up next to one another. At 10,000 frames/second would a thinner line make it tougher for the Lynx to accurately do its job? To summarize my [possibly] confusing questions, I wondered if the Lynx could possibly choose an actual winner (vs dead heat) with a thinner line? I’d love to know how they can actually tell who won – like in your examples. Are the actual images much higher resolution and they zoom in very close? I second that – now we know how the image is taken but I still have no clue on how to judge by it. Meanwhile – Chapeau Mr. Ring. I had been meaning to send you a message asking for explanation of this. I’ll be checking out the latest Ride Magazine – now on Zinio – for sure. The software handling the images allows the operator to zoom into individual pixels (if necessary) to determine the result. You can add a line (normally red in the images above) to see which wheel crosses the plane of the finish first. Have a look here (http://www.purdy.org.uk/pfinish/photofinish.htm) for some excellent details on how it all works in the UK. And look here (http://www.purdy.org.uk/pfinish/gallery_lynx_close_1.htm) for some examples of what a close finish looks like. Does the rider lower down in the photo (closer to the camera) not have an advantage? In the propeller example, the blades lower down in the photo come into shot much later than the blades at the top of the photo. Couldn’t this effect be used to a rider’s advantage? For example, if it takes 1/100th of a second to scan the image from top to bottom, 2 riders 1/100th second apart but at the top and bottom of the image would appear to be reaching the finish line at the same time. Have I misunderstood this? Or is it the case that the time frame for these effects is so tiny as not to be significant? 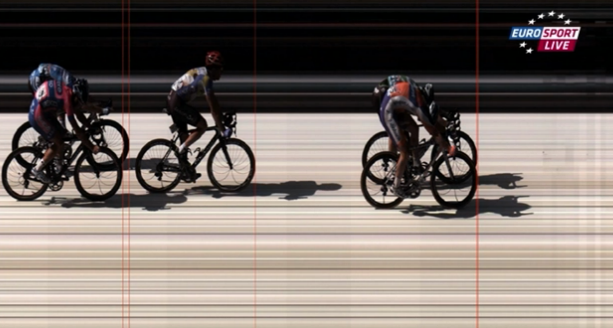 Yes, you’ve misunderstood slightly – on that video, the scanning line is going from top-to-bottom, but on the photo finish example, the scan line is always vertically up the finish line, so that it’s scanning as the riders pass. Similar to (but not exactly like) if that video was rotated 90 degrees clockwise. Yes, I used the propeller example and the video shows top to bottom scan but the photo finish is along the finish line. thanks. All is now clear. I wonder how fast the vertical scans are made though? And the resolution of the image? I often think this will be the ultimate limit of world records. Eventually the 100m record will be broken by 1000ths, then 10,000ths as they reach the ultimate limit of physical achievement. The effects on the wheels is due to the fact that the outer parts of the wheel is moving faster then the inner parts of the wheel. Notice how the spokes seem to bend more further away from the center. And velocity of the edge of the tyre is zero at the bottom and [twice??] the bike velocity at the top. Thus more bending on the bottom. This Blog is unremittingly entertaining and informative. Best cycling thing out there. One of the best tings full stop! 1) A normal photo is an image of different places taken at exactly the same time. This may be obvious (as it’s how we see the world! ), but it’s useful to think about it to understand the second part. If you look at two objects in the image and measure how far apart they are it will tell you the distance between them. 2) A photo finish is an image of the same place, taken at different points in time. As you scan from right to left, you’re moving through time rather than space. If you look at two objects in the image and measure how far apart they are it will tell you the _time_ between them. Very interesting article! One minor but critical correction is that the winner only has to touch the plane of the finish line not actually cross it. This could be critical when only 0.008 seconds is involved! On an interesting note, if the winner is decided by front wheel crossing the line if someone skids and crashes, and their bike spins round during the crash (rear wheel crossing line first) and they end in a photo with second place rider??? Also do you actually need to be connected to your bike to finish or can you run over the line, or can a bike finish without a rider!? Yes, you can finish a race on foot but you must have the bike with you. And note the rule quoted above, it defines the front wheel as the point where the finish is described. I’ve wondered about the on foot / carry regulation. Thanks. Andy A, I experienced this exact thing. See my comment below. I finished sliding with my bike and have the photo finish to prove it. Actually, the Lynx camera system is what is know as a “line scan camera”. It does not use an area sensor like most digital cameras that capture a complete image at once. It uses a CCD sensor with only three vertical scan lines. Each line is assigned either red, green or blue to create a colour image. The camera is positioned looking only at a thin slice of space at the finish line. Think of it as a document scanner where paper is drawn past a line scan sensor but in this case the riders are the paper. Wow. Never thought I’d learn how my iPhone camera works on this blog. Great job! Neat article. I’ve been wondering about those bent spokes and assumed it was some camera artifact, but didn’t know what to call it. Now I do. This must be how it can have a barcode scanning app, could a normal digital camera do this? I always find the photo finish interesting. Get some miles in will ya! Thanks for post. How come the white background? Is that due to the same effect? It’s all white, because every part of the image, is showing the finish line. The red line isn’t the finish line – it’s all the finishing line. The red line is a point in time. That’s why in the second photo above, they are also lunging for 4th and 5th place – it’s because they are also crossing the line at that point in time. So it’s a compilation of finish line rolling shutter images put together by the software? Take it it’s not one very long continuous shutter? The red lines are markers put in on the computer to indicate the edge of a rider’s tire. If you think about it as graph coordinates, on a regular photo, both the X and Y axes are space. In these photos, the Y axis is space (the width of the road along the finish line), but the X axis is time. By the way, the photo-finish from Tour of Turkey has been reviewed after the stage. The winner is still Mark Renshaw but they have cut the winning margin down to 0.0003 seconds. Here’s a good example of how a photo finish camera works summed up all in one picture. I unfortunately am the one demonstrating it by sliding across the finishline. At least it was still a top 10.
inrng i think ur site is the best out there now, i like the articles that u cover,continue to do the great work u have been doing. i am now a certified fan of urs, great writing. love the topics u cover,u go deep in the subject areas very deep, u discuss things that the others dont. It can if you inspect the photo properly. Speaking in Tom’s X/Y dimension terms, the trick is to ignore the X direction and look at how much of the tyre is in contact with the red line in the Y direction.